How our fast-forward minds make something out of nothing We all know expectations matter--in school, in sports, in the stock market. From a healing placebo to a run on the bank, hints of their self-fulfilling potential have been observed for years. But we've never fully understood why. Journalist Chris Berdik offers a captivating look at the frontiers of expectations research, revealing how our assumptions bend reality. We learn how placebo calories can fill us up, how fake surgery can sometimes work better than real surgery, and how imaginary power can be corrupting. Mind Over Mind is a journey into the most exciting area of brain research today. --New Scientist "Mind Over Mind takes us deep into the human psychology of expectation through the worlds of wine tasting, penalty kicks, compulsive gambling, and police lineups. Berdik delivers an optimistic message with a convincing punch: understanding the power of imagination can challenge our assumptions about what it means to be human and liberate us from the tyranny of self-fulfilling prophecies." 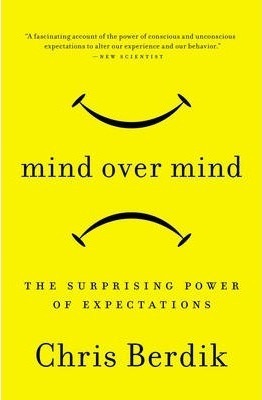 "Mind Over Mind is a captivating read, a mix of great stories and compelling science that shows us how expectations can influence our success--for better and for worse. Berdik gives us the tools to change our own behavior and influence others." "This is a delightful book: a mind-bending survey of what scientists are beginning to learn about the remarkable powers of the imagination. Fascinating, illuminating, and full of surprises, Mind Over Mind will forever change the way you think--about the way you think." "Chris Berdik's vivid portrait of the placebo effect and related phenomena reveals that our brains are the clumsiest of time travelers, altering life in the present by anticipating outcomes in the future. So many books about the brain focus on what's going on in other people's heads. Mind Over Mind helps you see what's going on in yours." "From the French court of King Louis XVI to today's neuroscience labs, Mind Over Mind surveys the too often neglected and misunderstood power of our expectations--over our health, performance, and preferences. With wide-ranging examples from the worlds of sports, business, politics, and medicine, Chris Berdik has whipped up an engaging soufflé of a book brimming with quirky and surprising detail." Chris Berdik is a science journalist and a former staff editor at the Atlantic and Mother Jones. He has written for numerous publications, including New Scientist, the Boston Globe, the Washington Post, and the San Diego Union-Tribune. He lives in Boston.